As specialist manufacturers of electro-hydraulic actuation and control equipment we offer comprehensive, purpose designed, engineered and manufactured solutions for the operation of choke and control valves for onshore and offshore installations. The electro-hydraulic stepping actuator provides a cost effective alternative solution to the mechanical ratchet style mechanism occasionally used for the positioning control of choke valves. The assembly incorporates a hydraulic control system that is activated by an integral position controller in conjunction with a 4 to 20 mA command signal. 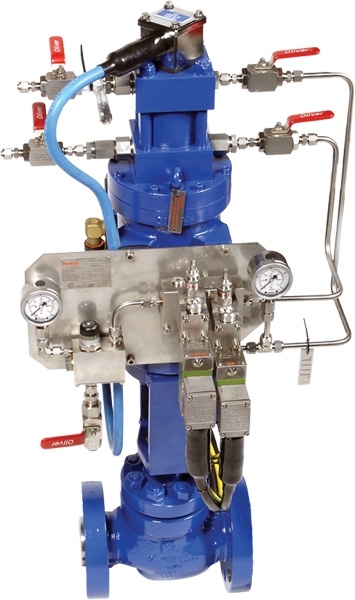 The hydraulic control system is connected to a ring main pressure and return hydraulic header, or may incorporate a self-contained electro-hydraulic power supply within the actuator assembly. The hydraulic control system comprises manifold mounted solenoid valves and speed control valves with hydraulic supply pressure filter and pressure gauge. Components are manufactured in 316 stainless steel and may be housed within a stainless steel control cabinet to provide additional environmental protection and security. The actuator assembly is designed with an interface to suit the standard valve top works. With the control system connected to the hydraulic supply, a change in command signal will cause the valve to operate by energisation of the respective solenoid operated control valves in a series of pulses until the selected position is reached. See ACS Range Hydraulic and Electro-Hydraulic Actuators Brochure for further information.